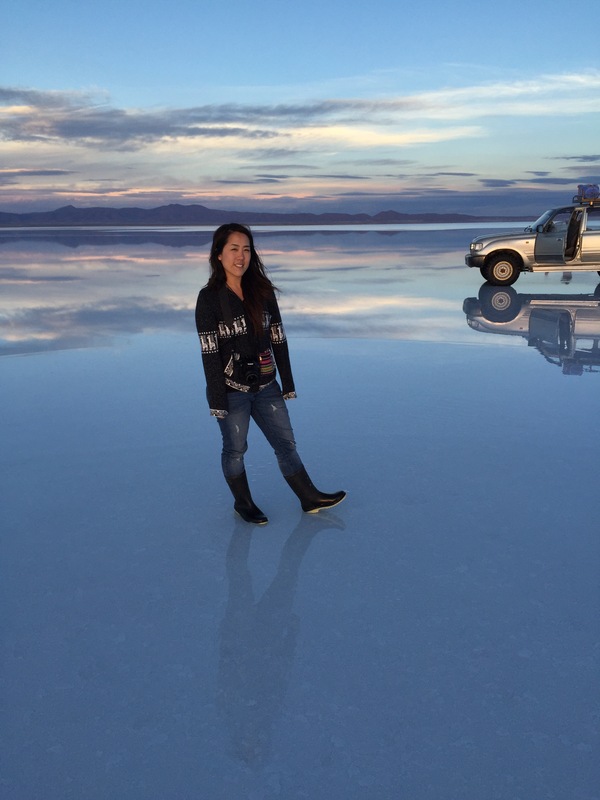 This post is a little late, but I wanted to write this post for those of you who may be planning a trip to Peru and wanted to stop by Bolivia to see the salt flats. This is actually a very popular route that many travelers do, which is why I felt comfortable enough to do this solo even after hearing about bus raids, strikes, and robberies that can happen. If you research online, it has been known that tourist buses can be stopped en route and luggage stolen, but most websites I saw said this is only common with the overnight buses on the popular tourist bus lines, such as Cruz del Sur. Even after reading about this, I still took the leap because a friend of mine has done it before and said she had no problem at all. Hope I didn’t scare you away! But basically, what I did was I went to the travel office at the hostel I stayed at (Loki) and inquired about bus tickets. They gave me different options including Peru Hop/Bolivia Hop tickets, which I will talk about in a different post, and local bus tickets. Given the short time frame I had, I ended up buying a local overnight bus ticket from Cuzco to La Paz that cost me 98 soles (a little less than $33 USD). After I got back from Machu Picchu, I got all my stuff together at the hostel and called a cab and went straight to the bus station. There’s basically a main bus station (bus terminal) in the city that has a bunch of different bus companies and ticketing booths you can buy tickets from. Then I hopped on the bus and headed to La Paz! I think it was a 10-hour bus ride. The bus company I used was Trans Salvador and it was clean, had comfy seats and I was able to sleep! Once we actually got to the Peru/Bolivia border via Desaguadero (1 of 2 border entries) we had to get off the bus and get our exit stamps and then walk across the bridge into Bolivia. If you get confused, just follow the people that were on your bus! Then you wait in line at the Bolivian customs office. I had my extra passport photos ready (cause I was told I would need them), I had my $135 USD ready (in new bills), and my yellow fever vaccine certificate. All of which were not needed! Instead, they only charged me about $60 USD and wanted a copy of my passport page with my Peruvian stamp. And lucky for me, their electricity was out at the time so I had to walk back across the border to Peru to get a copy of that passport page. -__- I guess I should’ve been happy that I didn’t have to pay as much for my visa, but did you know a lot of other countries do not have to pay for a Bolivian visa? Oh the joys of being from the U.S! Anyhow, after I got my visa, we headed back to our bus, which was now on the Bolivian side and then we drove some more to finally get to La Paz. They dropped us off at the bus terminal and from there I caught a cab with these sweet Brazilian girls I met on my bus ride and got dropped at the Loki in La Paz. 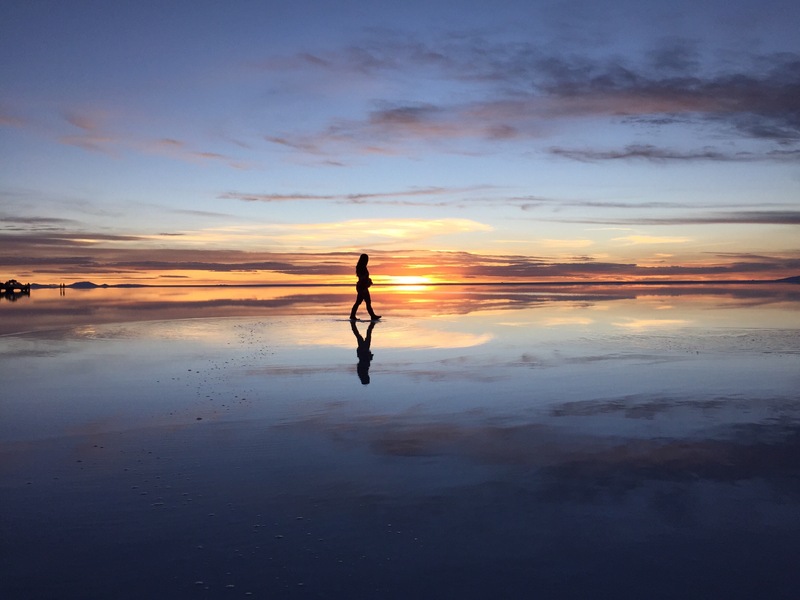 I was in desperate need for a shower and wi-fi to research bus companies to Uyuni (where the salt flats are) so I ended up paying for one night at Loki even though I knew I was leaving La Paz that same night. 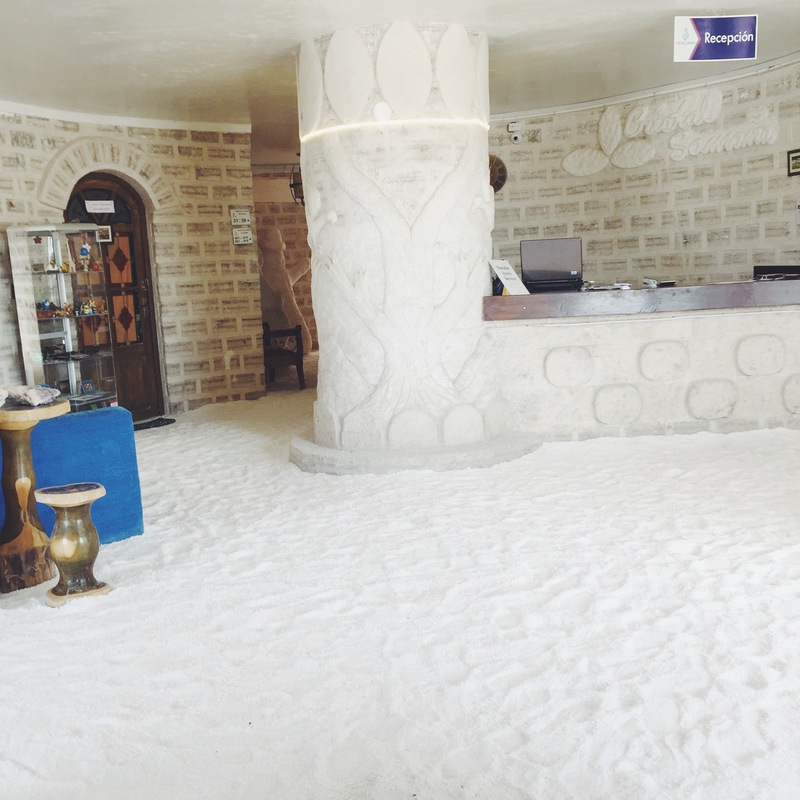 After showering and resting a little in La Paz, I took a cab and headed back to the bus terminal and looked for the bus company called Todo Turismo because I read a lot of great reviews about this company. It took me a bit to realize, but the Todo Turismo office was actually across the street from the bus terminal. Anyway, I ended up buying another overnight bus ticket for that night that cost me 270 bolivianos (a little over $40 USD). The bus ride to Uyuni from La Paz was another 10 hours I think. 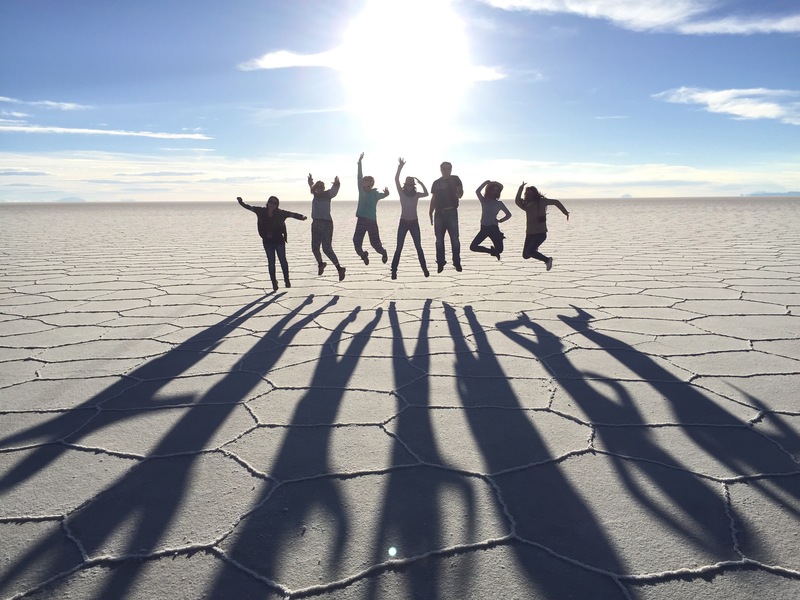 We left around 9pm and got to Uyuni around 7am. Although Todo Turismo is one of the more expensive companies, it is known for their comfort and safety. They even provide a meal and a blanket for the ride. I would definitely recommend them. 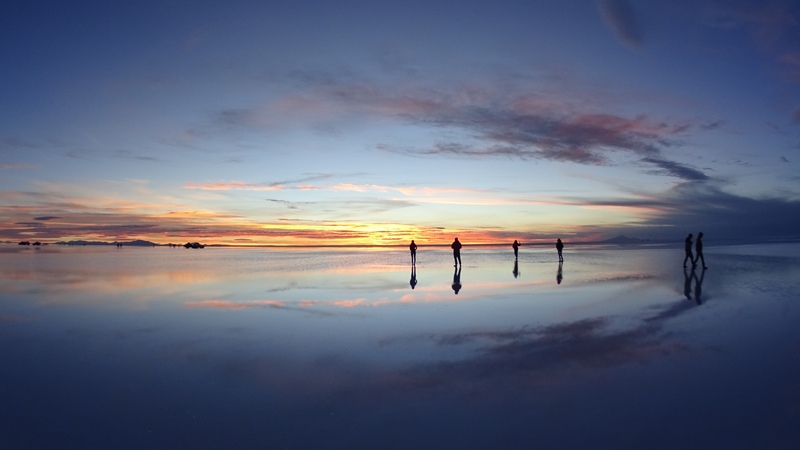 Once I got to Uyuni it was time to find a tour company for the salt flats. Don’t worry, as soon as you get off the bus there are loads of people who will try to sell you their tours. 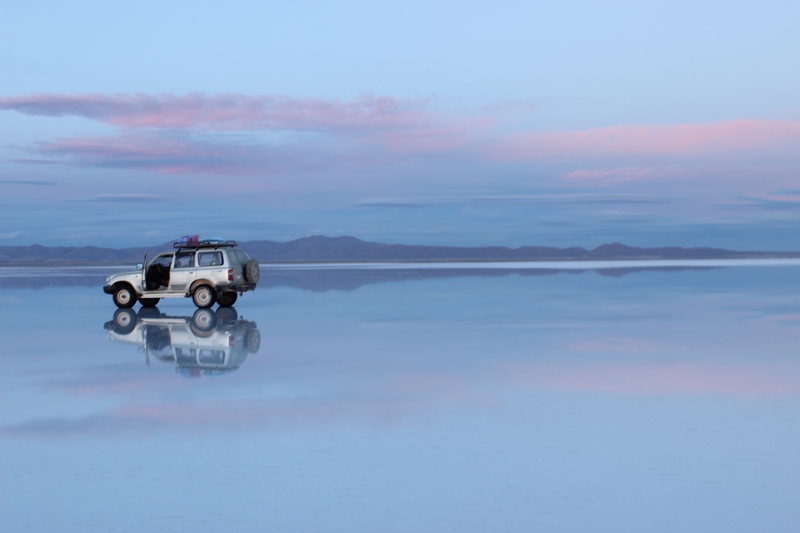 Typically, most people pay for a 2 or 3 day tour of the salt flats, but there are also some 1 day tours available. Lucky for me a man approached me whom I got a good vibe from and I asked him about a 1 day tour and he was able to squeeze me into his other tour group who was going on the 3 day tour. I wish I could remember the company name, but he was such an awesome tour guide. His name was Eladio! I ended up paying 280 bolivianos for the 1 day tour that included the sunset. Before we took off, I got myself a little breakfast and then made sure to get some extra cash before I left. You basically always need cash on you most places in Peru and Bolivia, but definitely more so in Bolivia. 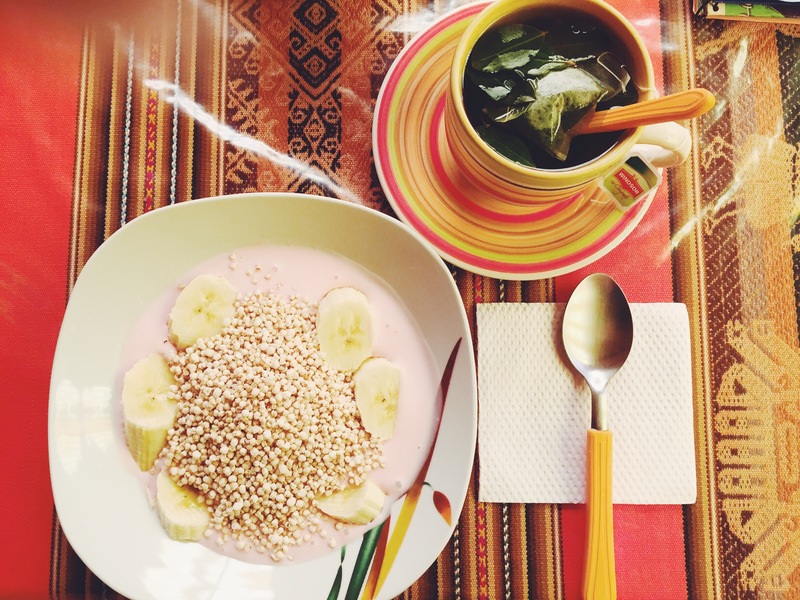 Yogurt with bananas and quinoa (I think?) and some cocoa tea of course! 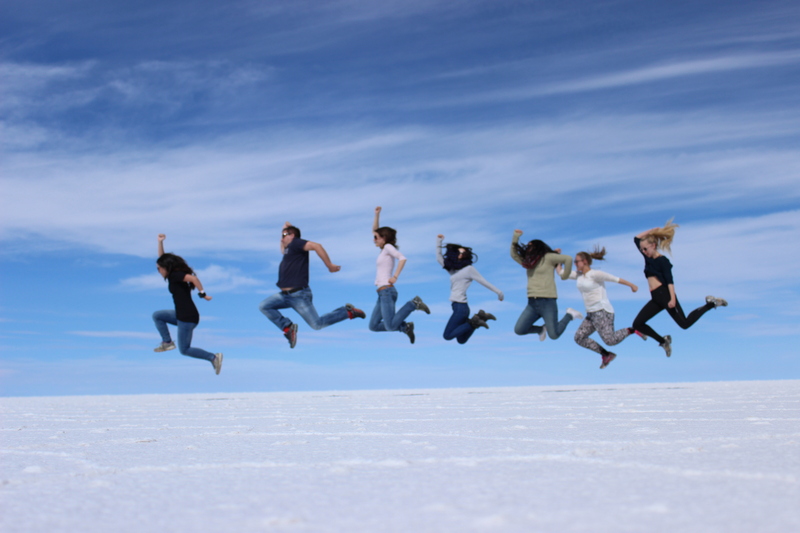 And then finally we were off to Salar De Uyuni. 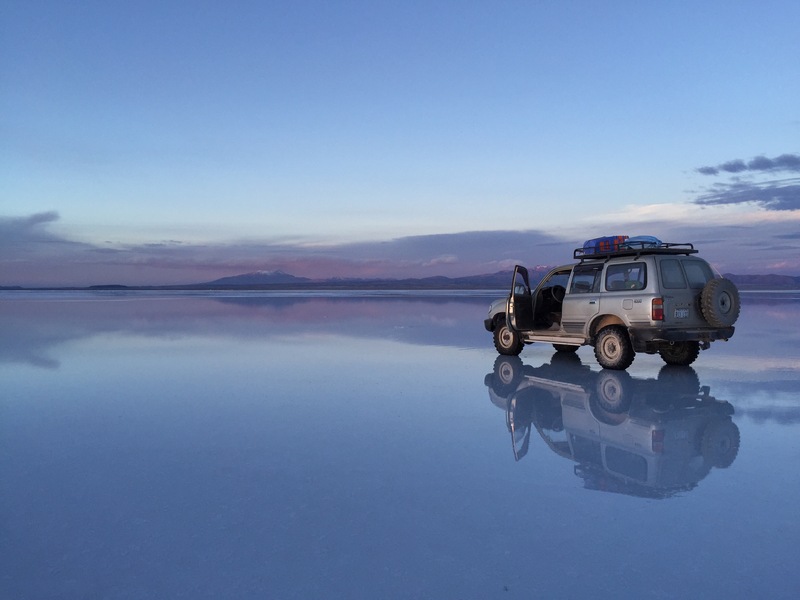 The world’s largest salt flats! 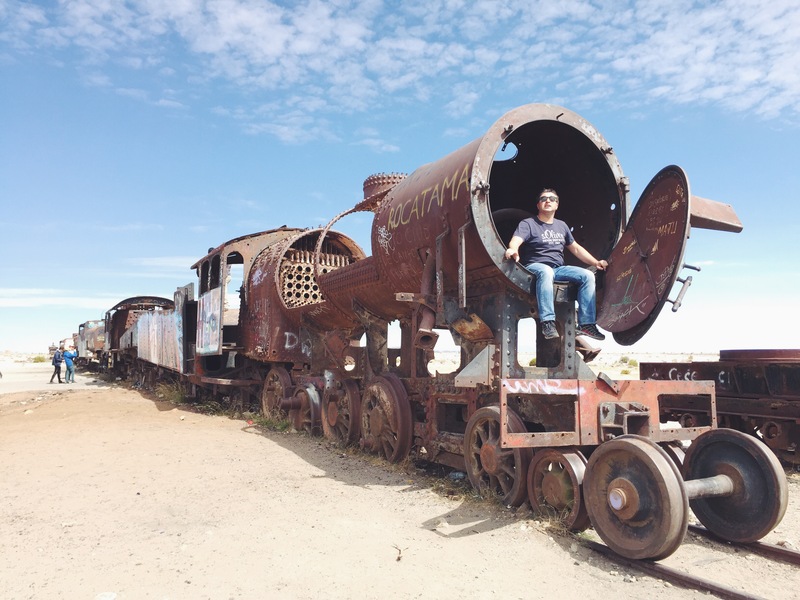 We took off in our land cruiser (8 of us including the driver) and first headed to the train graveyard as they call it. I need to practice jumping (me at the very left). Hehe. After taking loads and loads of pictures, we headed to Fish Island. 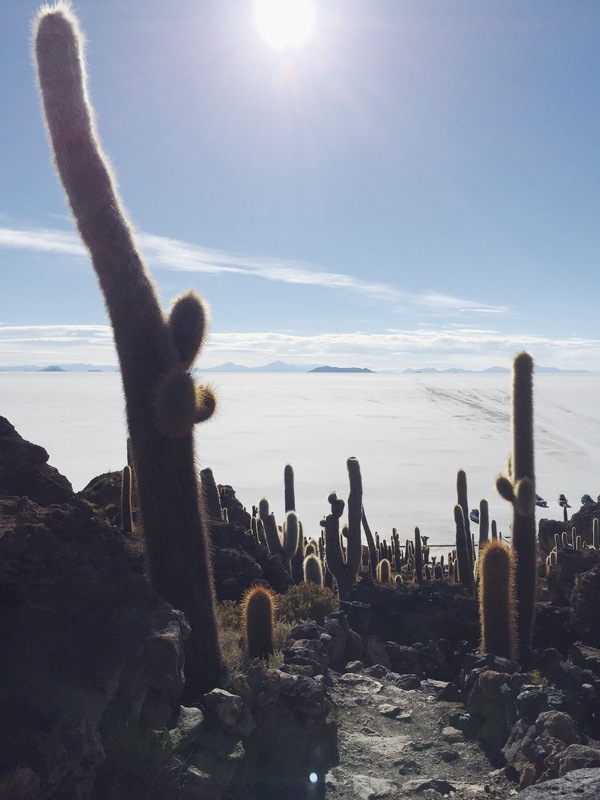 Fish Island isn’t actually an island, but it is an area inside Salar De Uyuni that is made up of coral and jumbo cacti! Our tour guide said if you look at the island from above it actually looks like a fish. It cost an extra 30 bolivianos (not a part of the tour cost) to tour inside. I ended up paying for it cause you can go on a short hike and get some great views of the whole “island”. I almost forgot, we had lunch there that was prepared by our tour guide/driver Eladio (included with tour price). Pretty strange and cool, right? 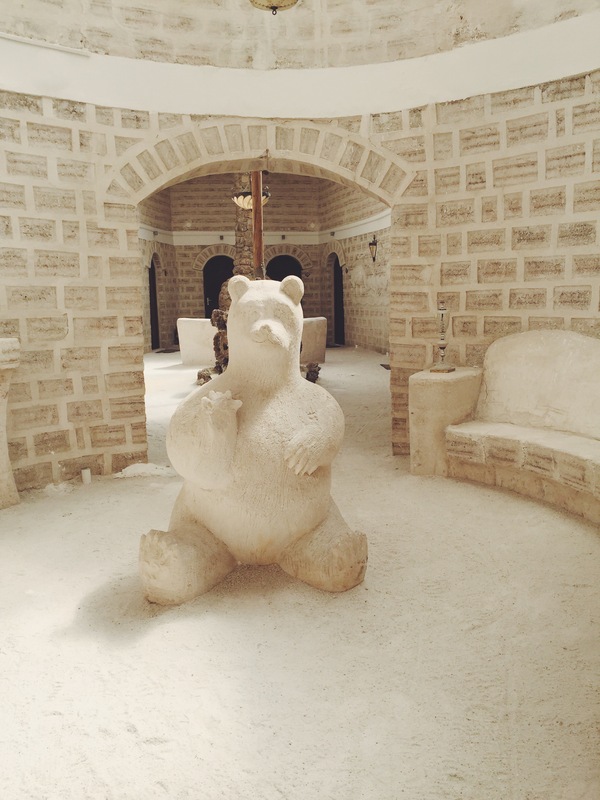 Then we went to check out a salt hotel. 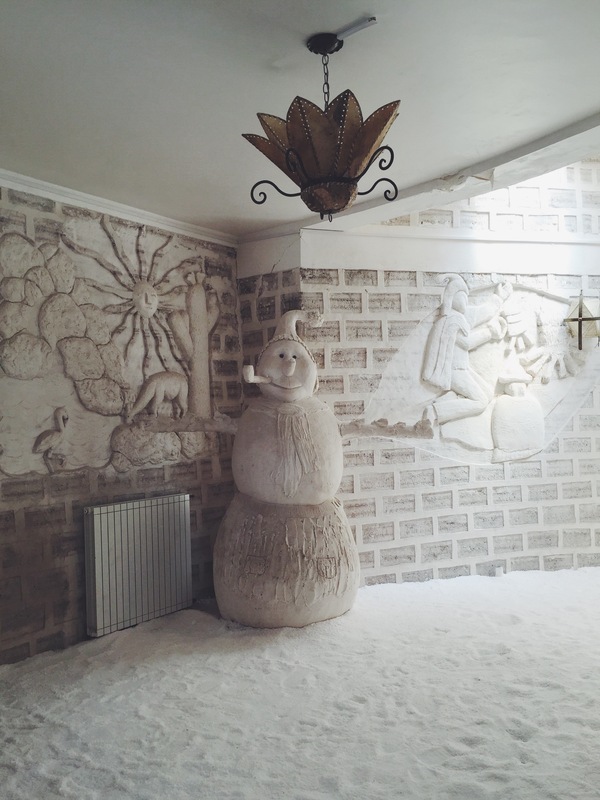 That’s right, where everything is made of salt! We also saw this little area where they had a bunch of different flags from all over the world that travelers placed. The funny thing is there was no flag from the U.S! And then afterwards, we finally headed for the grande finale. 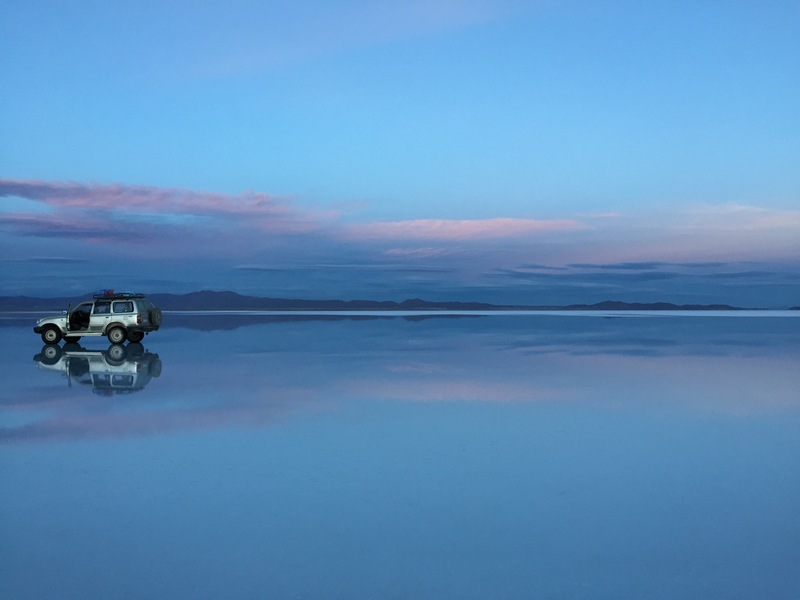 Sunset at Salar De Uyuni! Words can’t express the emotions I felt when I first laid eyes on this natural wonder. Take a look for yourself! I was in awe and pictures don’t do justice. 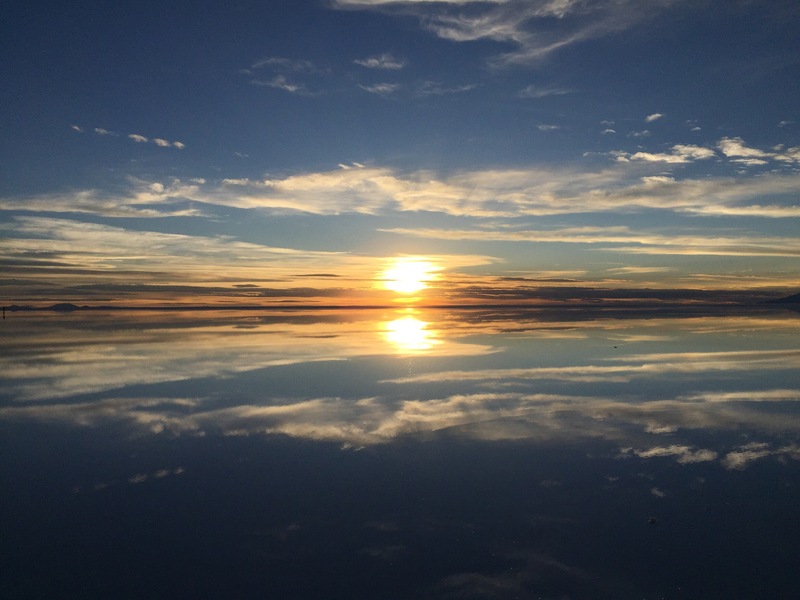 The water covering the salt flats made everything into a gigantic mirror. Have I convinced you to head to Bolivia yet? 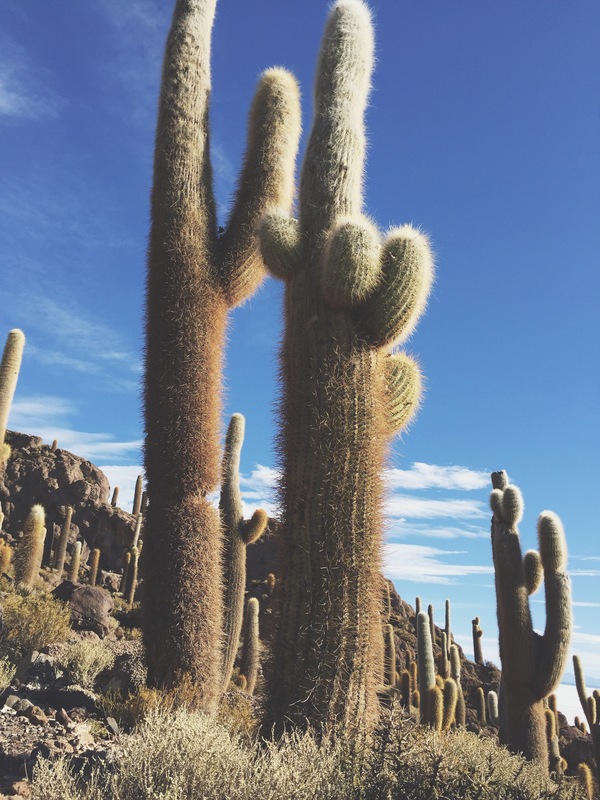 I really wish I had more time to explore Bolivia but unfortunately since I only had two weeks in South America I planned my trip based on Machu Picchu and Salar De Uyuni and planned everything else around these two places. 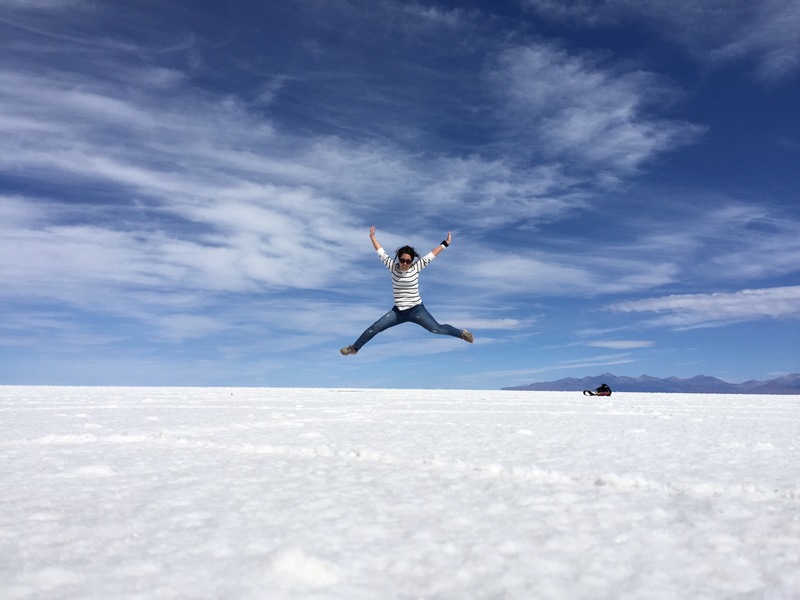 After the salt flats, I was torn between stopping by Lake Titicaca (Copacabana on the Bolivian side and not Puno which is on the Peruvian side) or going to Huacachina in Peru to sandboard. After talking to a lot of travelers I met, every one of them raved about how fun Huacachina was so I decided to stick with my adventure themed vacation and headed to Huacachina! Plus, I love snowboarding and I wanted to see how sandboarding compares. I ended up taking another overnight bus with Todo Turismo again back to La Paz from Uyuni. Then once I got to La Paz I headed straight to the bus terminal and bought a bus ticket back to Cuzco. The bus company name was Litoral. I basically just chose whatever bus company that headed out to Cuzco that same day. This company was not as nice as the others I took, but it was still very roomy and comfy enough for me to sleep. Once I got back to Cuzco, I stayed with Loki one last night and bought a bus ticket with Peru Hop to head to Huacachina and then to Lima to head back home (Oh, the sadness!). I’ll post a separate post on Peru Hop later. Anyhow, that’s about it on my journey to Bolivia from Peru. 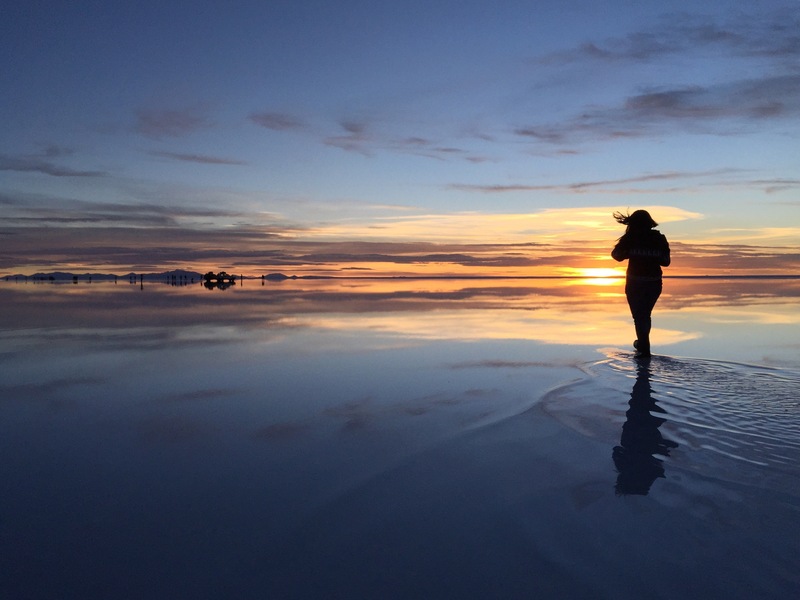 Although I spent a few nights sleeping on buses, it was still worth it to be able to see the mind-blowing, Salar De Uyuni and cross off a place on my bucket list! La Paz is known to be an unsafe city with a lot of crime. In fact, Bolivia is the poorest country in all of South America so it is not surprising that crime is very common here but my advice to you is to use your common sense and research a little before you go. For example, don’t go walking the streets of La Paz alone at night (common sense, right?)! I never felt scared traveling on the night buses because there was always people around at the bus terminals and on the buses. I have also read that there are fake police officers sometimes at the border that will try to ask to see your passport and belongings, but fortunately I did not witness this at all. However, if it does happen to you, everyone says to just ignore them and walk on. I promise crossing the border is not that bad. Be careful which taxi cabs you use. Always ask your hotel or hostel to call a cab for you or ask the cab driver to see their official paperwork. Make sure to have cash on you! But not too much either in case theft happens. And before you decide to exchange all your Bolivianos before heading back to Peru, make sure you keep 2 Bolivianos to pay for the bus tax. Just ask before you leave to make sure how much. Make sure to have snacks! A lot of these local bus companies do not stop on these long bus routes so you better make sure you have some food handy so you don’t starve on these 10+ hour bus rides. The bus terminals have places to buy snacks and food. Keep everything valuable in your daypack with you on the bus and store your other luggage in the bus storage. One of the buses I went on wasn’t fully occupied so I was able to have both my daypack and big backpack with me on the bus. 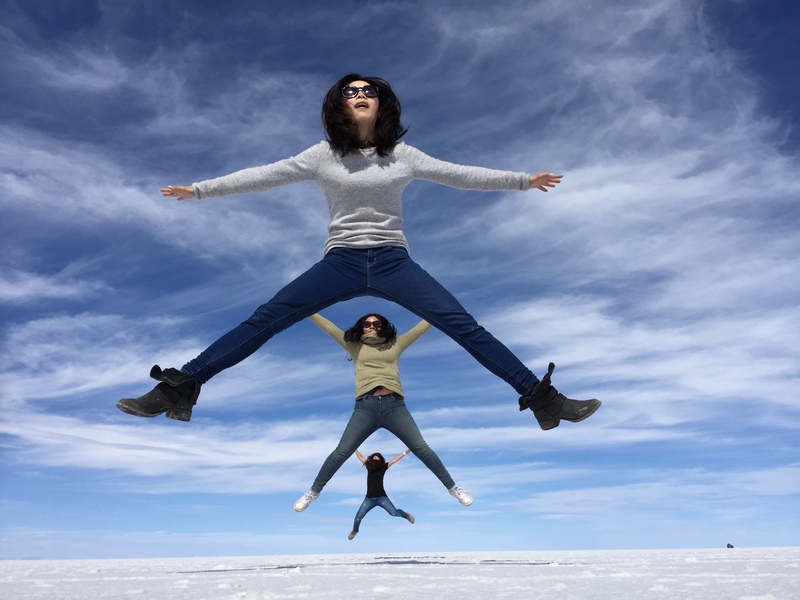 Make sure to wear sunscreen and have sunglasses at the salt flats! The sun reflects on the salt and is very bright and it gets very hot too! But also very cold once the sun sets so have a sweater/jacket handy. 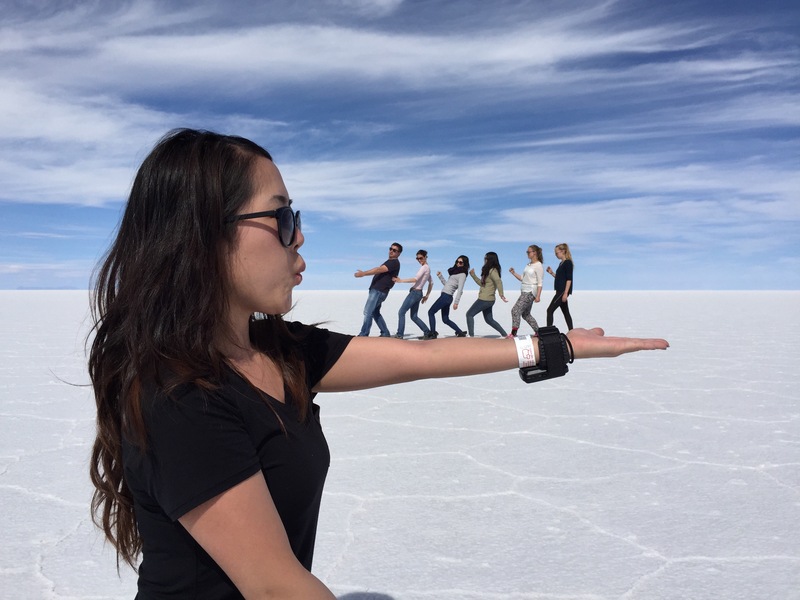 Be careful which tour company you use to see the salt flats. Many companies have been known to have drivers who drive drunk and there have been instances where people have died from accidents. I kind of took a risk by going with the man who randomly came up to me, but I didn’t get any bad vibes and trusted my instinct. Instinct is such a powerful tool and remember to never ignore it! If you get a funny feeling, listen to yourself, and remove yourself from whatever bad thing, person, or place right away! Always have a pen with you. This should go for anytime you travel, but you will need a pen to fill out the Customs paper at each border crossing. Take a flag with you to represent your country. And somebody please go put one of the U.S.! Drink lots of cocoa tea and water! 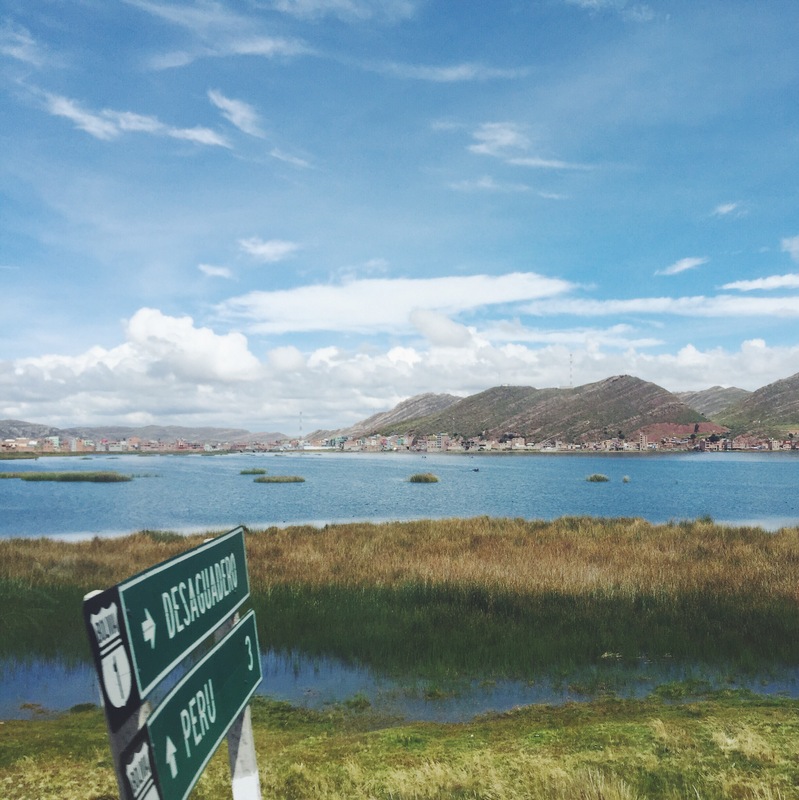 Although I wasn’t affected by the altitude in Cuzco at 11,000 ft above sea level, I definitely felt the difference when I got to La Paz, which is almost 12,000 ft above sea level! I think I also felt the effects because I went from Machu Picchu (lower elevation than Cuzco), to Cuzco, and then headed to La Paz that same night. 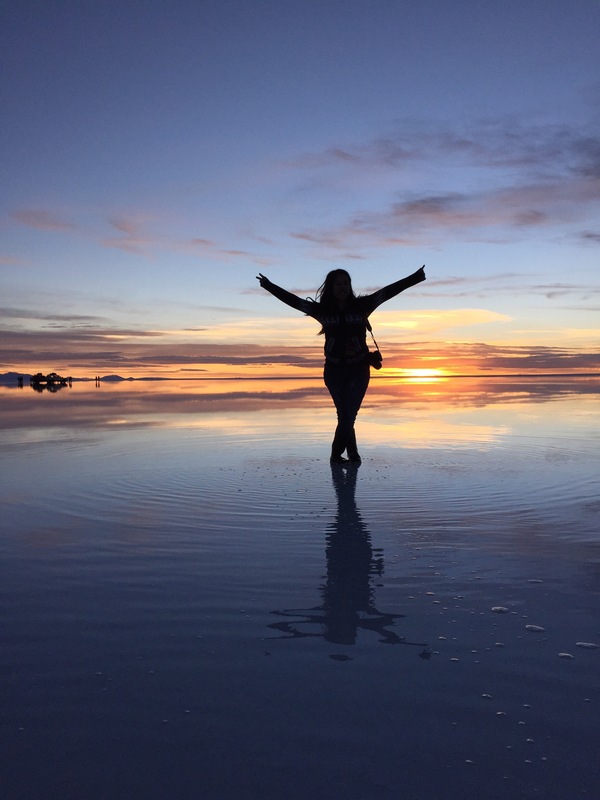 I hope this post was informative and inspired you to add Bolivia to your Bucket List! Thanks again for taking your time to read and please feel free to comment, ask questions, and share your experiences if you’ve already been! Great post! Super informative and your pictures are breathtaking! OMG! Love the photos! Especially those in the dessert! Brilliant!